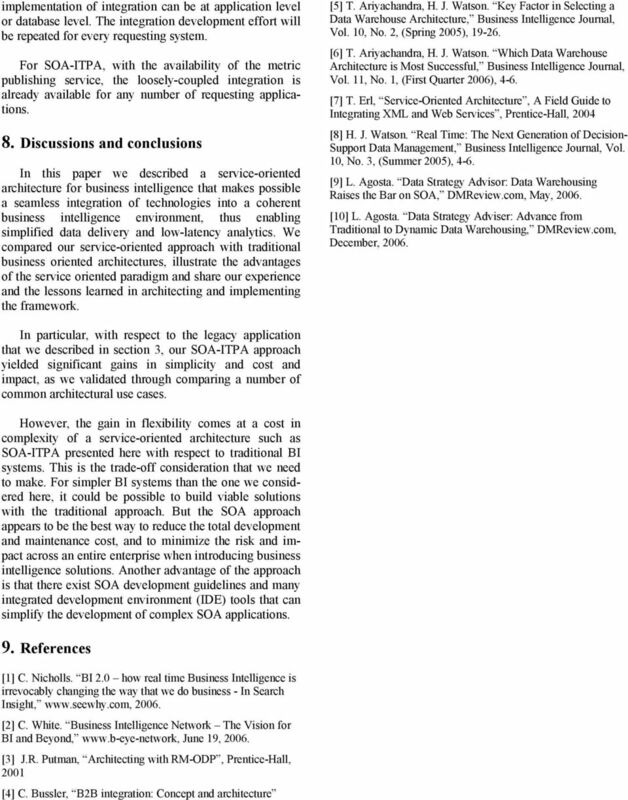 Download "A Service-oriented Architecture for Business Intelligence"
1 A Service-oriented Architecture for Business Intelligence Liya Wu 1, Gilad Barash 1, Claudio Bartolini 2 1 HP Software 2 HP Laboratories Abstract Business intelligence is a business management term used to describe applications and technologies which are used to gather, provide access to and analyze data and information about the organization, to help make better business decisions. In other words, the purpose of business intelligence is to provide actionable insight. Business intelligence technologies include traditional data warehousing technologies such as reporting, ad-hoc querying, online analytical processing (OLAP). More advanced business intelligence tools such as HP Openview DecisionCenter - also include data-mining, predictive analysis using rule-based simulations, web services and advanced visualization capabilities. 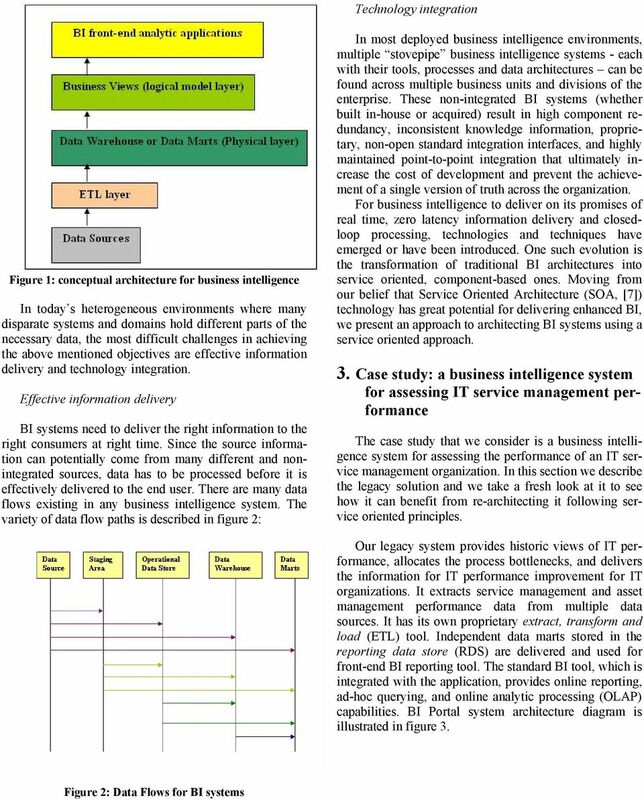 In this paper we describe a service-oriented architecture for business intelligence that makes possible a seamless integration of technologies into a coherent business intelligence environment, thus enabling simplified data delivery and low-latency analytics. 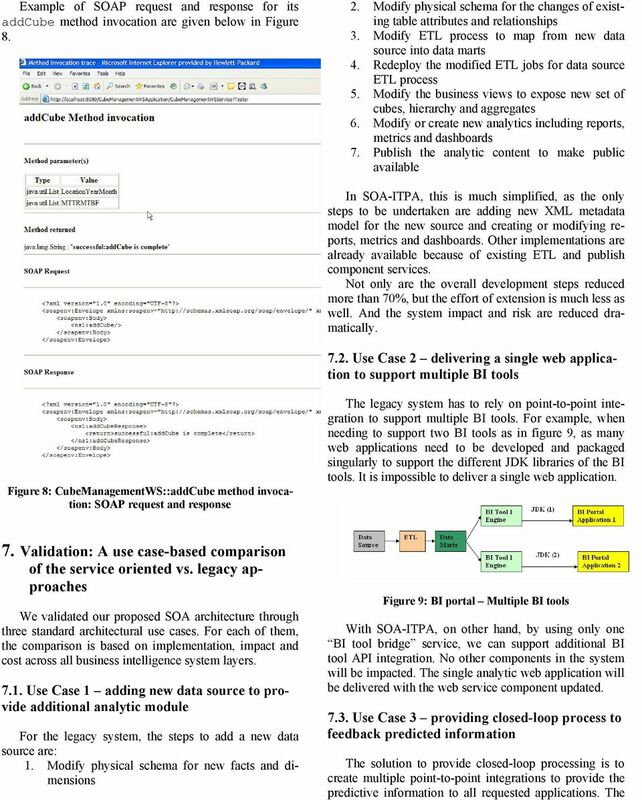 We compare our service-oriented approach with traditional BI architectures, illustrate the advantages of the service oriented paradigm and share our experience and the lessons learned in architecting and implementing the framework. 1. Introduction Business intelligence (BI, [1, 2]) is a business management term used to describe applications and technologies which are used to gather, provide access to and analyze data and information about an enterprise, in order to help them make better informed business decisions. Business intelligence technologies include traditional data warehousing technologies such as reporting, ad-hoc querying, online analytical processing (OLAP). More advanced business intelligence tools such as HP Openview DecisionCenter - also include data-mining, predictive analysis using rule-based simulations, web services and advanced visualization capabilities. Traditionally, BI systems have been architected with focus on the back-end, which is usually powered by technologies for data warehousing. Lately, architectures for business intelligence have evolved towards distributed multi-tier enterprise analytic applications. 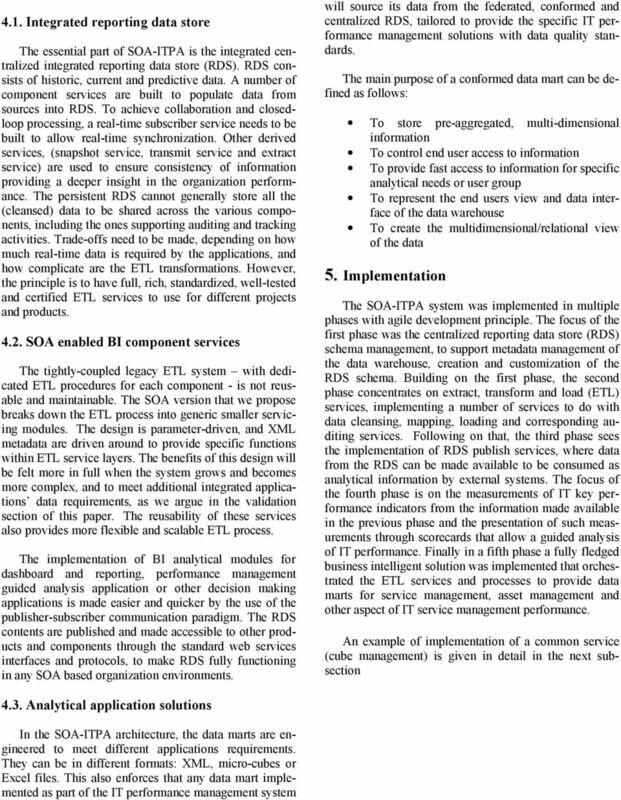 In this paper we describe a service-oriented architecture for business intelligence that makes possible a seamless integration of technologies into a coherent business intelligence environment, thus enabling simplified data delivery and low-latency analytics. We compare our service-oriented approach with traditional business oriented architectures, illustrate the advantages of the service oriented paradigm and share our experience and the lessons learned in architecting and implementing the framework. The remainder of this paper is structured as follows. 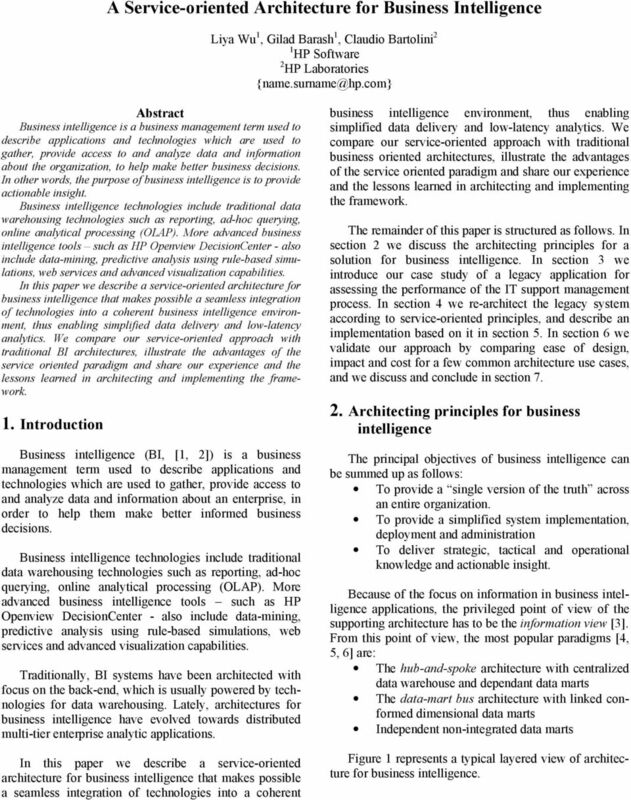 In section 2 we discuss the architecting principles for a solution for business intelligence. 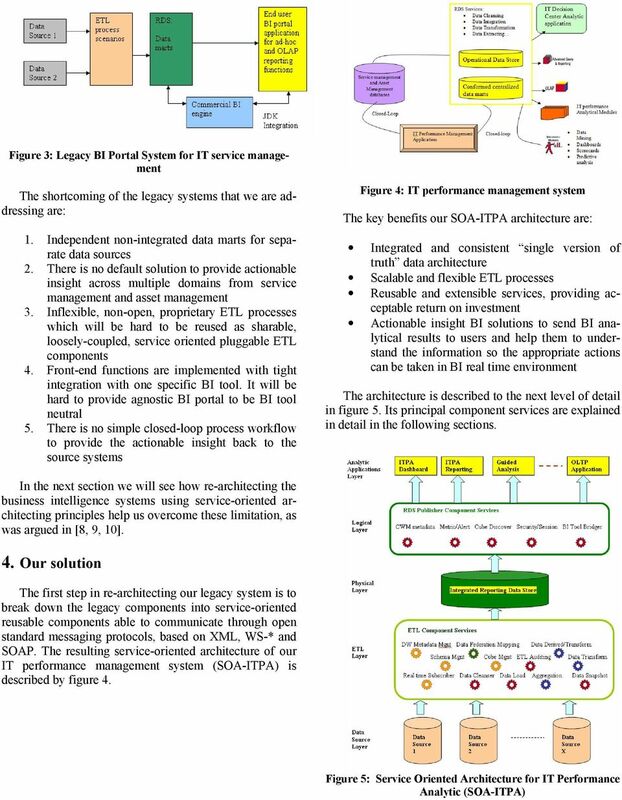 In section 3 we introduce our case study of a legacy application for assessing the performance of the IT support management process. In section 4 we re-architect the legacy system according to service-oriented principles, and describe an implementation based on it in section 5. In section 6 we validate our approach by comparing ease of design, impact and cost for a few common architecture use cases, and we discuss and conclude in section Architecting principles for business intelligence The principal objectives of business intelligence can be summed up as follows: To provide a single version of the truth across an entire organization. To provide a simplified system implementation, deployment and administration To deliver strategic, tactical and operational knowledge and actionable insight. Because of the focus on information in business intelligence applications, the privileged point of view of the supporting architecture has to be the information view . From this point of view, the most popular paradigms [4, 5, 6] are: The hub-and-spoke architecture with centralized data warehouse and dependant data marts The data-mart bus architecture with linked conformed dimensional data marts Independent non-integrated data marts Figure 1 represents a typical layered view of architecture for business intelligence. 5 6. SOA-ITPA service sample implementation: CubeManagementWS Figure 6: WSDL description of CubeManagementWS web service CubeManagementWS (WSDL description in Figure 6) is a web service sample which has all datamart (in the following cube ) related operations for other applications or products to use for creating, population and describing the cube data. A cube is a specialized version data available in the data warehouse. Cubes contain snapshots of operational data that helps business people to strategize based on analyses of past trends and experiences. 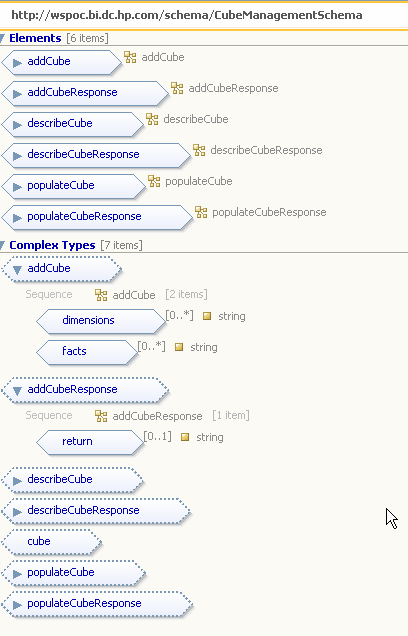 The creation of a cube happens on a specific, predefined need for a certain grouping and configuration of select data. The dimensions of a cube represent the various facets of a given fact (which is the unit of information in the data warehouse). 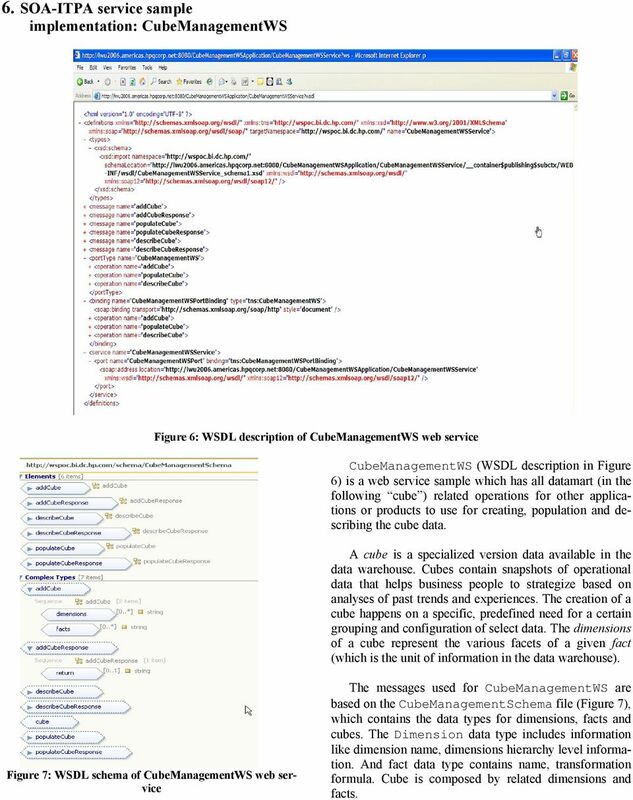 Figure 7: WSDL schema of CubeManagementWS web service The messages used for CubeManagementWS are based on the CubeManagementSchema file (Figure 7), which contains the data types for dimensions, facts and cubes. 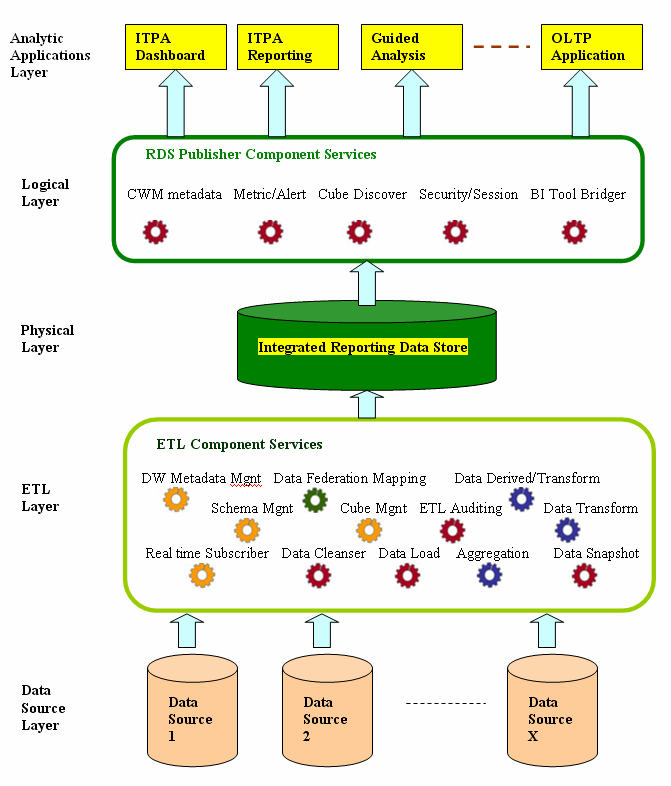 The Dimension data type includes information like dimension name, dimensions hierarchy level information. And fact data type contains name, transformation formula. Cube is composed by related dimensions and facts. Hanumat G. Sastry Dept of Computer Science School of Science and Technology Dravidian University India-517 425 sastrygh2000@yahoo. Mitra Innovation Leverages WSO2's Open Source Middleware to Build BIM Exchange Platform May 2015 Contents 1. Introduction... 3 2. What is BIM... 3 2.1. History of BIM... 3 2.2. Why Implement BIM... 4 2.3.